Earlier today, while distracted by a YouTube video doing some article research, I started watching Stephen Colbert's interview at Google with Eric Schmidt. It's pretty great, and you should definitely watch the whole hour - seeing Colbert out of character (and talking about that character) on video for so long is a rarity. He's a really smart guy, and hilarious, to boot. But during that interview, early on, I caught something that really resonated with me. Let me show you, so you can see what I'm talking about (if the time code doesn't work for you, go to 8:10 into the interview). Not only do a large number of the Googlers in the audience laugh when Colbert admits he has no idea what Google Play is, some of them even applaud. That's reassuring. Now, admittedly, Colbert could be playing up his ignorance a tiny bit, but given he's a well-off TV show host now, I think it's just more likely that he has little reason in the first place to know Google Play is a thing. A lot of famous people - actors and artists in particular - actively try to shield themselves from what's "hip" and "new" to maintain a sense of normalcy in their lives. So really, it's not surprising that Colbert doesn't know that Google Play exists. I can't for the life of me remember where, but I once read that the first time Christopher Walken saw someone using a key to unlock a car remotely, thus causing it to flash the headlights and "beep," he froze and said - to the car - (I'm possibly paraphrasing slightly) "whoa - your move." I only really bring up the Colbert bit because it struck such a chord - not because I think him in particular not knowing Google Play exists is especially indicative of some huge brand recognition problem. It was the impetus for a question, though: do most people really know what Google Play is? Frankly, I still hear more people I talk to refer to it as "the [Android] Market" or even the "Android app store." Living in the Android universe bubble, it's easy to think everybody just sort of gets Google Play, and that even though it's a silly name that doesn't really explain itself well, we all understand its purpose. But outside of this bubble, I don't think most people really do understand it. Google rebranded the Android Market as Google Play back in March. At that point, I found myself ambivalent, but optimistic - Android Market really wasn't a very good name. It sounded just a little too boring. And also, at the time, I liked the new Play Store logo - a play button. That's clever. A play button is something you associate with songs, movies, and media generally. It's about content. I don't think many people really got that. Today, I still have to force myself to think of the Google Play logo as a play button - it doesn't intuitively come to mind for me. Maybe it's the colors, maybe it's the fact that I think of recreational, fun definition of play before I do a play button, but the branding hasn't clicked in my mind after all this time. They could change it tomorrow, and I wouldn't care - I associate no feelings or relationships of consequence with that name. It's too vague and weird. Saying it aloud makes me feel silly. To be fair, Google Play is still quite young. I can't personally remember, but I doubt Apple's App Store became a recognizable brand overnight (and when it did, it was largely on the shoulders of iTunes). This kind of stuff takes time. But I also feel like the Play brand has gained next to no traction since launching - like the last nine months of Google Play really didn't happen. I'm all too aware that Play had its disparagers from day one of the change. It sounded frivolous - unserious, unprofessional, and nonsensical. I don't really find myself caring all that much how professional the name of a content store is, though. That seems like kind of a weird thing to be concerned about. I'm far more interested in the association a person makes with the brand, because I know I don't really make any strong associations with Google Play - and I see it literally every day. The Content Hub That... Who Wanted? Looking at the image below from the landing page of the web Play Store, we see Android Apps are near the bottom of the list. Even though, in all likelihood, that's what you're looking for if you're on Google Play. It doesn't make sense. I would love to see the proportion of visits to play.google.com that end on an app page, as opposed to another Play content area. I don't think I'm alone in saying that the app and game side of the Play Store is all I care about 99.9% of the time. Movies, books, and music are a no man's land with their own little apps that I basically don't touch. I have not yet come to terms with the concept of Google as a non-app content provider (and I may never) to which I give my money, and that's mostly because they still aren't very good at it. Though it's not for a lack of trying to shove that content in my face. I don't go to that little tote bag icon on my phone for music. Or books. Or movies. I go there for apps and games. Changing the name to Google Play and strong-arming non-app content into the UI (and my search results) wherever possible has done nothing to change that perception. In reality, it just ended up annoying me a little bit. As far as I'm concerned, adding movie and music results to my searches isn't "content discovery" - it's in-house advertising. To put a finer point on it, in creating Google Play, and merging apps, music, movies, and books under a single content umbrella, I feel Google failed to ask a critical question: do people on Android actually want such a hub? I think this is also a big part of why the Play brand has such poor marketplace recognition. The Play Store is filling a niche on Android that, frankly, I don't believe many people were demanding in the first place. From day one, Android has pushed with fervor the notion of controlling your experience, of having choice, and a more open app and content ecosystem. That ecosystem has flourished. Amazon MP3, Spotify, Pandora, Netflix, Hulu, Kindle, NOOK, Kobo, and various other 3rd-party content providers (along with local media playback apps) have all set up camp - and surprise of surprises - most people are happy with that. Because of that flourishing 3rd-party ecosystem, Google doesn't, and may never, have the loyal / captive following of content customers that Apple built up over the years with iTunes even before the iPhone even existed. I won't go as far to say the opportunity is gone, but I'd argue damn near unless Google does something revolutionary on the pricing end (nudge, nudge, all-inclusive subscription). At this point, I really believe Google is better off splitting its content arms up. Apps and games should have a store, movies and TV should have a store, music should have a store, and so on. And ditch that triangle logo. Actually, I'm genuinely curious, does anyone really think it's all that attractive or distinct? Personally, I like it less every month. Anyway, I can't say I see how the Play brand switch has benefitted Android at all to date. If anything, it's confused the nexus (no pun intended) for apps and games by diluting it with a bunch of unrelated, not-particularly-special non-app content. And it shows, considering how many people still call it the Android Market - or just the app store - for the sake of clarity. Google Play is opaque. 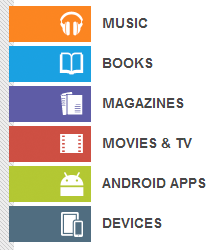 It does not suggest "apps, games, movies, music, and books" - it suggests "something Google calls Google Play." I'm sure it was brilliant on the marketing drawing board, but it just doesn't seem to be panning out on the ground. So, I implore you Google: give us an Android App Store. I might even settle for Android App Hub, despite the slight Samsung overtones. Leave Movies, Music, and Books where they belong - as Google products. What's so awful about Google Music, or Google Movies? Hell, Google Books is already a pretty strong mark. While the Play experiment is not yet old enough to be declared a failure, I cannot say I see a bright future ahead for Google's unified content brand aspirations.